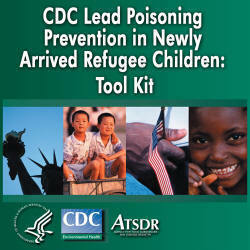 The Centers for Disease Control and Prevention's (CDC) Lead Poisoning Prevention Program in conjunction with the Office of Refugee Resettlement developed the Lead Poisoning Prevention in Newly Arrived Refugee Children tool kit in response to the increasing number of refugee children entering in the United States and subsequently developing elevated blood lead levels. On April 21, 2000, a 2-year-old Sudanese refugee girl became the first child in the United States known to have died from lead poisoning in 10 years. Her exposure occurred in the United States and was caused by lead paint in the home. Beginning in May 2004, after the resettlement of 242 refugee children, predominately from Africa, it was discovered that a significant number of the children age range from 6 months to 15 years developed elevated blood lead levels after their arrival to the United States. Most of the children were resettled to a state that had a policy to screen refugee children for lead during their initial health examination. The first blood lead screening was done within 90 days of the children's arrival; the second screening was done 3 to 6 months after their placement in permanent residence. Most of the children had initial capillary blood lead levels <10 micrograms per deciliter, which supports the hypothesis that exposure occurred after arrival to the United States. Environmental investigations revealed moderate lead hazards in the residence and some contamination in soil in play areas frequented by the children. The children showed evidence of extreme chronic malnutrition and other moderate to severe health conditions. Lead poisoning continues to be a reoccurring problem for refugee children resettled in the United States. Although little is known about lead exposure in their country of origin, data collected and research supports that most of the children are poisoned after their resettlement to the United States. Blood lead level testing of all refugee children 6 months to 16 years old at entry to the United States. Repeat blood lead level testing of all refugee children 6 months to 6 years old 3 to 6 months after refugee children are placed in permanent residences and older children, if warranted, regardless of initial test results. Upon U.S. arrival, all refugee children should have nutritional evaluations performed, and should be provided with appropriate nutritional and vitamin supplements as indicated. Evaluate the value of iron supplementation among refugee children. CDC and its state and local partners should develop health education and outreach activities that are culturally appropriate and sensitive to the target population. Effects of lead poisoning among children. Lead sources in children’s environments and ways to reduce the risk of exposure. Nutritional and developmental interventions that can mitigate the effects of lead exposure. Ways to provide comprehensive services to children with elevated blood lead levels. The tool kit is divided into three sections. Purpose: This self-guided module provides information about the importance of identifying and determining possible lead hazards in the homes of newly arrived refugee children, assuring blood lead medical services to these children, and educating the refugee population on lead poisoning prevention. Intended Audience: This module was developed for refugee coordinators, refugee health coordinators, state and local health departments, and additional organizations involved with the well-being and resettlement of refugees. Purpose: This self-guided module provides information about CDC's recommendation for identifying children with elevated blood lead levels and early post-arrival medical evaluation and therapy. Intended Audience: This module was developed for those involved with direct medical services to refugees. Purpose: This section includes resources for refugee resettlement workers and medical providers such as frequently asked questions about CDC's recommendations for lead poisoning prevention in newly arrived refugee children, fact sheets, training materials, links to childhood lead poisoning prevention organizations, and more. Intended Audience: These resources were collected to assist anyone interested in learning more about the issue of lead poisoning among newly arrived refugee children. We would like to receive feedback from you on the usefulness of this tool kit as it applies to your job. We would also like to know what we can do to enhance this product and that of future tool kits. Please email leadinfo@cdc.gov and let us know.